We in the Church of Jesus Christ are living in a time when there is much anxiety about the changes in our society and how it relates to our local churches. We all know well the laments. "We don't have children in our Sunday School like we used to." "We used to have large confirmation classes and the youth began getting involved in our church. Now, after confirmation, we barely see them or their families." "We don't have as many people in the pews on Sunday mornings." "Our giving is not what it used to be." We all know the challenges. Church programs competing with the schedules of sports teams and a multitude of extracurricular activities. Aging facilities with costly upkeep and repairs. Tight budgets and hard decisions, which create anger and resentment towards church leaders. Sporadic attendance at worship services and programs of those who would categorize themselves as active member. Fewer people willing to volunteer and commit to attending worship services and support the work of the church on a regular basis. We know something is broken, but really don't know what to do. And so we lament, and we try to recycle strategies and tools that worked for us in the past. Yet, such things are no longer effective. In the midst of it all, we still hear Jesus calling. Jesus calling, summoning, and inviting us to follow him. Jesus continues to call the people of every time, place, and generation to the adventure of discipleship. Jesus is calling us. Calling us to trust that if we follow his ways of extending unconditional love and grace to all people, we will be able to "fish for people," connecting with people who are in need of and seeking a relationship with God and the faith community. Author, Rev. Dr. Tod Bolsinger, in his book, Canoeing the Mountains: Christian Leadership in Uncharted Territories, correlates the current state of Christianity to the expedition of Lewis and Clark who were commissioned by President Thomas Jefferson to find a trade route via the Pacific Ocean. In the early 1800s, no one had dared to go west of the Mississippi, so Lewis and Clark set out with their canoes and expedition party, known as the Corp of Discovery, to paddle their way to the Pacific Ocean. Lewis and Clark were exceptional scientists and explorers. They carried with them the best supplies and knowledge Americans had to offer. Their President (the author of the Declaration of Independence, no less) had placed his faith in them. What did they have to lose? The commonly held assumption at that time was that the rivers were tributaries that eventually led to the Pacific Ocean. Believing this assumption, Lewis and Clark and the others on the expedition had canoes and equipment for what they thought would be the most logical mode of transportation. What they did not know and would soon discover was, it was the Rocky Mountains on the other side of the river bend, not the Pacific Ocean. At one point, they had to make a decision to keep going with all the equipment that was weighing them down or to drop the canoes. 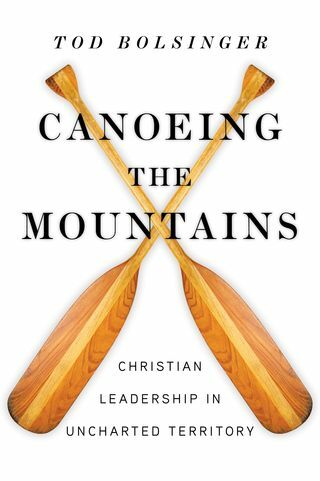 Throughout the book Canoeing the Mountains, Bolsinger uses this historic journey as the backdrop for the current reality of Christianity and the church as he claims, "We must recognize that we're staring at mountains and all we have are the canoes that brought us this far." However, Bolsinger offers the five vital lessons the Church must learn and embrace in order to continue the journey of discipleship in uncharted territory. 1) The world in front of us is nothing like the world behind us. 2) Trust is essential if people are to follow you into unfamiliar territory. 3) We must learn to be adaptable. 4) Not everyone will want to go with us into this uncharted season of ministry, and that's not all bad. 5) Transformation is the end game. Yes, at this moment, we in the Church are navigating a journey into uncharted territory. But we do not have to do it alone, and we are not without hope and the resources to learn together, not only to survive, but also to thrive. In this new year, we will be reflecting on this together. We will begin the journey at our Day of Discipleship (Saturday, March 3 at Evangelical UCC in Highland, Illinois) as we will hear from Rev. Dr. Kristina Lizardy-Hajbi, director of the Center for Analytics, Research and Data, about the trends and shifting landscape we in the Church must be aware of and attend to. At Day of Discipleship, we will also have the opportunity to hear and learn from one another about the effective missional programs of our ISC churches. In the upcoming months we will also create educational programs, listening sessions and opportunities for us to bear witness to the new and exciting ways we are answering the call of discipleship. Our reflection on Christian leadership in uncharted territory will culminate with a remarkable opportunity to hear from and spend time with the author of Canoeing The Mountains: Christian Leadership In Uncharted Territories, Rev. Dr. Tod Bolsinger, at our Conference Annual Meeting. Tod will be conducting a workshop for clergy and laity on Friday, October 26 and will be our keynote speaker at the Annual Meeting on Saturday, October 27. I hope you will mark your calendars and share the details with your congregations. Yes, Jesus is calling. Let us join the adventure.